The 1950's were a time of transition between wars, and football was a welcome distraction for many. The decade produced many Pro Football Hall of Famers and laid a foundation for the modern day NFL, and these Top 5 rookie cards of the 1950's jump out as super amongst the stars. Considered by many as the greatest football player of all-time, Jim Brown was one of the toughest and most athletic players ever to step on the gridiron. Leading up to his debut in 1958, Brown grew up playing all kinds of sport. In secondary school, he earned 13 letters playing football, lacrosse, baseball, basketball and running track. At Syracuse, in addition to football he excelled in basketball, track, and especially lacrosse, where he was named first-team All-American in his senior year. Playing in just 14-game seasons, Brown dominated as a professional, with countless accolades. Brown is the only rusher in NFL history to average over 100 yards per game for a CAREER, a record that still stands and is mind-boggling. He led the league in rushing for 8 of his 9 seasons and retired at age 29, making his overall career numbers all the more remarkable. Like many cards of this era, it is tough to find Brown's RC in pristine condition. PSA only lists 5 total PSA 9's in existence, while SGC and Beckett have graded some as well. In the lower grades you can still find some affordable copies for the more conservative collectors and investors (PSA 6 around $300, PSA 7 around $600). Three's no question Brown was one of the greatest football players ever, and his rookie card sits in the same echelon. The 50's were the era of the nickname, and Johnny Unitas had two of them: 'Johnny U' and 'The Golden Arm.' But it didn't start out that way. After an unceremonious career at Louisville, many people forget he was drafted in the 9th round by the Pittsburgh Steelers. But he never took a snap for the Steelers (even in practice) as Head Coach Walt Kiesling thought he wasn't smart enough to QB an NFL team. After a year working in construction, Unitas would try out for the Baltimore Colts in 1956, and the rest is history. Similar to Brown, Unitas popularity makes his rookie card a fan favorite and it can also be found at reasonable prices in lower grades (PSA 6's and 7's between $300 and $700 range). A PSA Mint 9 Unitas sold for $27,205 in 2012. Johnny U's rookie card is a great investment that will stand the test of time. From the same set as Unitas, another hall of fame quarterback in Bart Starr. Starr had a little more notoriety in college playing at Alabama, but like Unitas, did not begin his career as a starter. He was drafted in the 16th round by the Green Bay Packer in 1956 but did not become a starter until 1959, Vince Lombardi's first year as Packers head coach. He would go on to lead Green Bay to 5 NFL championships (he was named MVP of the first 2 Super Bowls), cementing himself as one of the all-time greats and making his 1957 Topps issue one of the most collected. Only three have received the grade of PSA 9, selling for $19,000 in 2011 while an SGC 96 was listed for sale at $17,500 in January 2013. Lower grades can be found between $300 and $600, with ungraded available in the $100-$300 category. 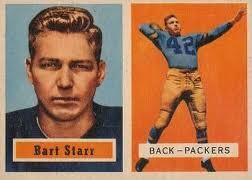 Adding another reason why the '57 set is one of the best of all-time, is Starr's Packer cohort, Paul Hornung. Hornung's professional success was expected, following a college career at Notre Dame where he won the Heisman trophy in 1956 as a halfback. In fact, he is one of only 3 players to have won the Heisman Trophy, selected 1st overall in the NFL draft, and inducted into both the Pro Football Hall of Fame and College Football Hall of Fame. Of the 886 cards submitted to PSA, only 10 Hornung rookies have come back with PSA 9 status. One of them sold in June of 2013 for nearly $8,000 in an auction conducted by Goodwin and Co. PSA 8's sell in the $1200-$1500 realm, with lower grades in the $100-$700 range. Graham was one of the most dominant quarterbacks of the era, leading the Browns to the championship game every year from 1946 to 1955. For some reason, Graham doesn't get listed with the all-time greats, but many argue that 'Automatic Otto' was better than Johnny Unitas or Bart Starr. Graham's NFL record of 57-13-1 is unparallelled. He was a winner, and even had a short basketball career: While waiting for his first football season to start in 1946, he played for the NBA's Rochester Royals and won a championship there in one season. Issued in six-card nickel packs, the 1950 Bowman set also is quietly one of the best of all-time, and Graham's rookie card leads the way, along with Y.A. Tittle. A PSA Mint 9 Graham sold for $26,209 in 2006. Lower graded versions can be found in the $200-$600 range. Paving the way for league that is so well known today, these legends are definitely worth to be listed as the Top 5 rookie cards of the 1950's.